The strong growth in online payments in 2017 is partly due to new applications for iDEALand through the use of the iDEAL QR code. Amsterdam, 30 Mei 2018 /EZPress/ - The iDEAL online payment method performed well in 2017, thanks to the underlying secure standards and uniform rules and regulations. 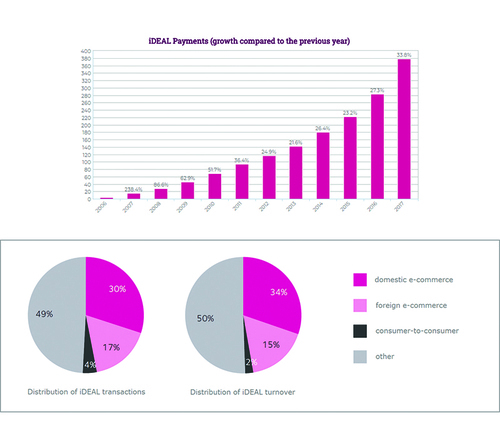 The number of payments with iDEAL has increased considerably more in the past year than in the previous five years, by 33.8 percent, according to the annual report 2017 of Currence, the product and brand owner of iDEAL. Online identification and login with iDIN on websites of companies and institutions, has been used 1 million times. iDIN relies on the same approach and technology as iDEAL. "The strong growth in online payments in 2017 is partly due to new applications for iDEALand through the use of the iDEAL QR code." This press release was distributed by ResponseSource Press Release Wire on behalf of Steijger Communications BV in the following categories: Business & Finance, Media & Marketing, Retail & Fashion, for more information visit https://pressreleasewire.responsesource.com/about.